Canadian pop-rock band Hedley have lost their performance spot at the Juno Awards (Canada’s equivalent to the Grammys) following sexual misconduct allegations against the band. On Wednesday, the Juno Awards revealed on Twitter that both the Canadian Academy of Recording Arts and Sciences—and Hedley themselves—decided the band will not perform “after careful consideration of the situation and in discussions with the band.” They were slated to take the stage at the show on Sunday, March 25, and are still nominated for three Juno awards. Throughout the week, fans have shared alleged incidents of inappropriate behavior at the hands of various members of the band—many of which occurred when they were teenagers—on social media. The “#outhedley2k18" hashtag picked up steam, and Twitter user @_cndnpsycho has been posting anonymous accounts from anyone who DMs them and consents to having their stories published. They include a range of misconduct and assault allegations, many involving underage fans. Hedley responded on Wednesday in a somewhat lengthy Facebook post, which begins with the futile gesture of saying they “applaud the #MeToo movement and the open and honest discussion it has inspired”...as long as it doesn’t involve their band. 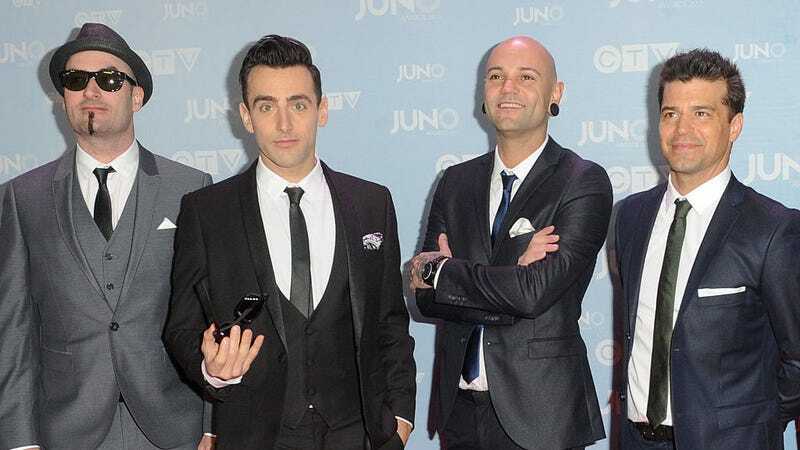 They subsequently take aim at the swell of allegations on social media which the band writes are “unsubstantiated and have not been validated.” Hedley maintains that they never crossed over into inappropriate behavior, before or after various members were married and entered long-term relationships. “There was a time, in the past, when we engaged in a lifestyle that incorporated certain rock and roll clichés. However, there was always a line that we would never cross,” the post reads. There isn’t much precedent for this sort of action from a major awards show. At the 2017 Oscars, the Academy responded to sexual harassment allegations against Casey Affleck by awarding him a Best Actor trophy. He won’t be attending this year’s show to present Best Actress on his own volition, because, duh. Although it’s hard to say whether actor James Franco would have been nominated or not for his performance in The Disaster Artist if sexual misconduct allegations against him hadn’t arisen, he was certainly expected to follow his Golden Globes win (for Best Actor in a Musical or Comedy) with an Oscar nomination for Best Actor. He—and his movie—were shut out entirely. The Grammys weren’t tested in such a way, mostly because allegations haven’t stuck with many high-profile musicians. Removing Hedley (and presumably, not giving them any awards) is a PR no-brainer for the Juno Awards, but given the Grammys’ jumbled, confused attempt at addressing the #MeToo movement at last month’s awards, it’s hard to really say, with any authority, that things would have gone down the same way. We’ve reached out to representatives for Hedley and will update with any new information.